This is one part of a wall of 3 for a small mural I did for a women’s/children’s homeless shelter clinic for Phoenix Children’s Hospital. I love those guys because they saved the life not once but twice of my husband’s sweet son Scott. Our family will always be grateful to them for what they’ve done. Oh and thanks my trusty assistant Maddie for the assist on this one! Oh, and yay Nemo! 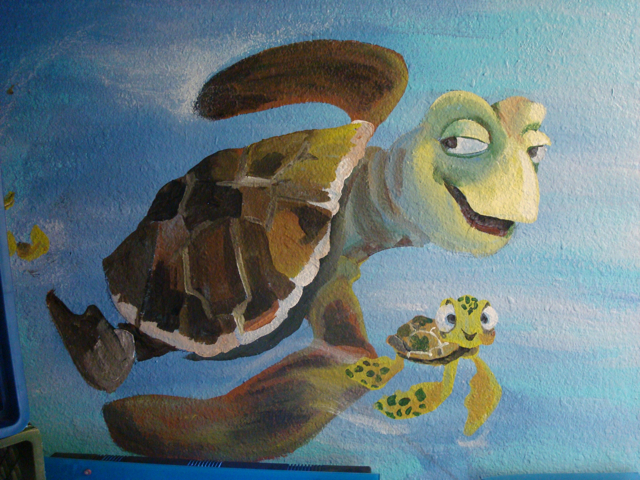 This part of the mural was painted on nice smooth wallboard. However the rest of the mural was done on very old, uneven bricks. It required first applying a thick coat of primer to smooth out the porous brick. It’s still a difficult surface to paint on, but doable if painted at the right angle. I figured children mostly would be enjoying this mural, so I got down to the child’s level and made sure the lines connected from their point of view. Good fun!